Fifty-one law enforcement officers were feloniously killed in the line of duty in 2014, according to preliminary FBI data. An additional 44 police officers were killed accidentally, with most of the deaths occurring in the Southern region of the US. Most of the criminal fatalities were from firearms, while the accidental deaths were largely the result of car accidents, the FBI said. 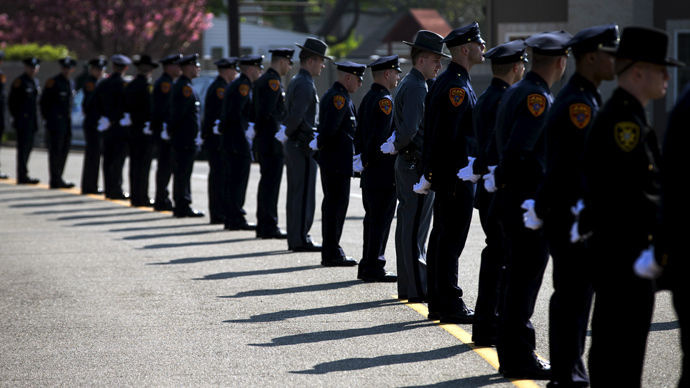 The statistics released Monday show an 89 percent increase over the 27 officers killed in 2013. Broken down into regions – 17 were killed in the South, 14 in the West, eight in the Midwest, eight in the Northeast, and four in Puerto Rico. The 51 officers died from injuries sustained in 48 separate incidents. Of the criminal deaths, 46 of the 51 were the result of the use of firearms. Handguns accounted for 32 deaths, with 11 incidents involving the use of rifles and three with shotguns. Four police officers were killed by vehicles and one officer was killed by an offender’s use of hands, fists, or feet. The incidents that led up to the officers deaths involved answering disturbance calls, conducting traffic stops or pursuits, ambushes, investigating a suspicious person, during investigations, and handling persons with mental illness. There were fewer accidental deaths in 2014 than in 2013, however. Of the 44 officers who died in 2014, compared to 49 in 2013, 28 died in automobile accidents (15 were wearing their seatbelts), six in motorcycle accidents, and five were struck by vehicles. Accidental shootings took two lives, and three others died in separate incidents of drowning, blunt force trauma and smoke inhalation. The FBI said statistics from 1980-2014 show an average of 64 law enforcement officers are killed criminally per year. Last year’s 27 deaths marked the lowest record during a 35-year period. Final statistics will be published on the FBI’s website in the fall via the Department of Justice.